Tauck’s classic four-island Hawaii tour incorporates natural and historical sights, exclusive cultural experiences, and free days to pursue your own passions on Oahu, the Big Island of Hawaii, Kauai and Maui. Stay in ocean-view rooms at some of Hawaii’s finest oceanfront resorts; have a hands-on gourmet cooking experience at a renowned restaurant on Maui; experience one of the most poignant chapters of World War II history at the USS Arizona Memorial in Pearl Harbor; take a private catamaran sail at sunset on the Big Island; hear a “talk-story” from a beach boy; take an outrigger ride along Waikiki Beach; attend a traditional luau on Maui; and enjoy a private evening highlighted by cocktails and dinner at Iolani Palace in Honolulu. Tauck’s Hawaii tour begins at The Royal Hawaiian. 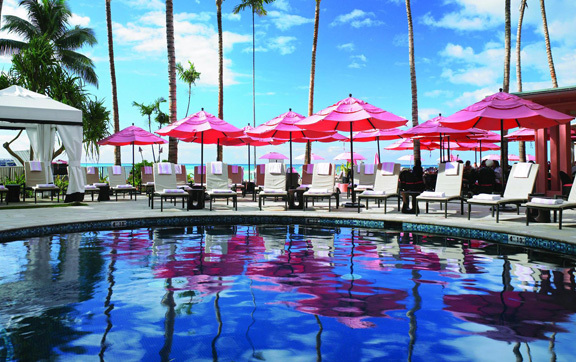 A transfer is included from Honolulu International Airport to your extraordinary resort, The Royal Hawaiian – affectionately known as the “Pink Palace of the Pacific” – set on the white sand shores of Waikiki Beach. Stay in ocean-view accommodations, and enjoy dinner with stunning views of the beach and ocean in the hotel’s acclaimed Azure restaurant, overlooking Waikiki Beach. Visit the USS Arizona Memorial at Pearl Harbor, a tribute to the military personnel who lost their lives in the December 7, 1941 attack, called the “Day of Infamy.” Further Honolulu sightseeing includes a drive through Punchbowl Memorial Cemetery and historic Honolulu, where you’ll have views of Washington Place, the sumptuous state capitol building and other sites. Tonight, your Tauck Hawaii tour begins with an exclusive evening – a private after-hours tour, welcome reception and dinner with entertainment at Iolani Palace, the opulent official residence of Hawaii’s former monarchy. Built in 1882, this National Historic Landmark reigns as the only official state residence of royalty in the United States. Circle the windward side of Oahu this morning for a tour of its southeastern beaches, bays and birds, including the beach featured in the film From Here To Eternity. Back on Waikiki Beach, meet a “beach boy” who will “talk-story” for you about the water skills required for this coveted job; then hop aboard a traditional outrigger canoe to catch the waves for an exhilarating ride – a true highlight of Tauck’s Hawaii tour! Fly to the youngest of the islands, the Big Island of Hawaii, home to Mauna Loa and Kilauea, two of the world’s most active and accessible volcanoes; the gentleness of their eruptions allows visits to the edges of their active vents. In 1866, when Mark Twain saw the sizzling lava of Kilauea, he wrote, “Here was room for the imagination to work!” At Volcanoes National Park, you’ll drive across the Kilauea Caldera (crater), where views vary from desert to lush tropical rainforest to alpine tundra. UNESCO named the park an International Biosphere Reserve because of its outstanding scenic and scientific values. The park protects a wide diversity of ecosystems and habitat for native Hawaiian plants and animals; it is also rich in cultural and historic sites. Your day ends at your resort on the Kohala Coast in the area once known as Kalahuipua’a, the birthplace of King Kamehameha I, who unified the Hawaiian Islands in the early 19th century. The area is crisscrossed by early Hawaiian footpaths, royal fishponds and lava formations. Spend the day doing whatever interests you most on the Big Island of Hawaii. You can set off on an optional two-hour helicopter excursion for a thrilling view of Kilauea’s fiery lava vents and the Big Island’s coastal rainforests, available at an additional cost per person (see Pricing & Availability for details). Or you can indulge in other optional activities offered by your resort (some at additional cost). Toward evening, join us for a catamaran sail along the Kohala Coast as the sun sets on another perfect day on Tauck’s Hawaii tour. Fly to the Garden Isle of Kauai, whose lush landscapes featuring orchids, hibiscus and plumeria are often used as a setting for Hollywood films depicting tropical paradise. Spend some time at a historic sugar plantation, Kilohana Plantation (of the finest examples of plantation era architecture in Hawaii) prior to a scenic drive that takes you through the Tunnel of Trees – formed by walls of eucalyptus trees towering above the roadway – and to Spouting Horn, an intriguing volcanic blowhole. Arrive late afternoon at your beachfront resort. If you wish, you may start your day on an optional 45-55-minute helicopter flightseeing adventure* over the rainforests and mountains of the lush “Garden Isle” (available for an additional charge; see Pricing & Availability for details). Then, the day is yours to enjoy as you wish – you may want to swim, snorkel, sunbathe, spot the island’s abundant marine life from monk seals to green sea turtles, or simply enjoy all your resort has to offer. Early this evening, your Hawaii tour continues with an informative interpretive lecture on the ecology of the Hawaiian Archipelago; dine at your leisure at the resort tonight. Fly to Maui, named for an ancient god. Travel through the mist-shrouded Iao Valley to see the famed Iao Needle, then past sugar cane fields to the historic port of Lahaina, an old whaling center and former island capital. Following some time on your own to explore Lahaina as you please, it’s off to the The Fairmont Kea Lanai, your beachfront resort home for the next three nights, set on the Wailea Coast. The remainder of the day is free; dine at your resort at your leisure tonight. Feel free to spend the early morning hours indulging at the resort before discovering the secrets of island cuisine. Maui chefs take delight in the abundance of locally raised beef, tropical fruits and vegetables grown in fertile volcanic soil, and fresh fish – often preparing them with a fusion of Asian, Californian and Hawaiian flavors. You’re invited for a look behind the kitchens attracting Maui foodies during a hands-on gourmet cooking experience with chefs during lunch at a well-known local restaurant. The remainder of the day is yours to explore or relax as you please on this island known for wildlife-rich waters and perfumed gardens… a favourite stop on any Hawaii tour. Today, Tauck’s Hawaii tour takes you to the 10,023-foot-high rim of Mount Haleakala (meaning “house of the sun”), the world’s largest dormant volcano (it’s been two centuries since its last eruption) and a UNESCO Biosphere Reserve. The crater is more than seven miles across, and hosts two endangered species, the nene (Hawaiian wild goose), and the silversword, a specially adapted plant. After enjoying extraordinary views from the mountaintop, learn about island agriculture as you descend through Maui’s upcountry farmland and return to your oceanfront resort for an afternoon spent as you wish. This evening, join us for a farewell feast of authentic Hawaiian culture at a private luau. Tauck’s classic Hawaii tour ends on Maui. 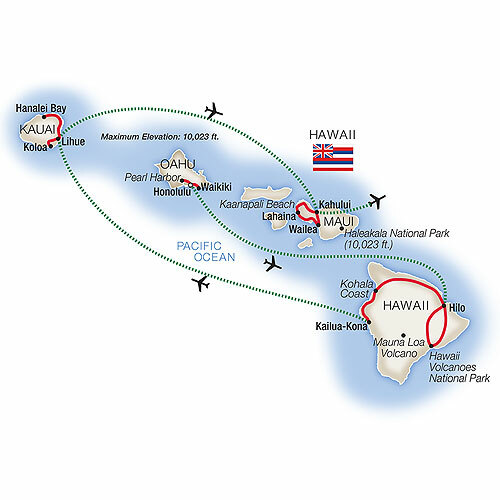 Fly home anytime; a transfer is included from The Fairmont Kea Lani to Maui’s Kahului Airport. Allow a minimum of two hours for departure flight check-in at the airport. *Rates are inclusive of all air travel between islands. Small Group Departures – Select small group departures, averaging 24 Tauck guests, are priced from AUD $11,860 per person double including on-tour air; specific dates apply – select “Small Group” in the pull-down menu above for complete pricing. Special Solo Traveller Savings – save AUD $380 on the single room price of select departure dates; specific dates apply – select “Singles Departures” in the pull-down menu above for complete pricing. Note: For activities marked with an asterisk (*) in the day-by-day descriptions, participation is at your own risk and a signed liability waiver will be required. Ocean-View Rooms. A beloved Hawaiian landmark, the legendary “Pink Palace of the Pacific” has welcomed guests to Waikiki for over 75 years. Set right on famed Waikiki Beach, this elegant Grande Dame provides a gracious introduction to traditional Hawaii with its the prime beachfront location and its charming old-world ambiance. Guest rooms offer all the amenities that today’s travellers expect, including cable TV with movie channels. The hotel offers a wide range of water sports and beach activities to enhance your leisure hours, with facilities including a private beach, inviting swimming pool, well-equipped Fitness Center and the Abhasa Waikiki Spa. Dining at the Azure restaurant is a memorable experience, as is indulging in lovely ocean views at the Mai Tai Bar. Ocean-View Rooms. 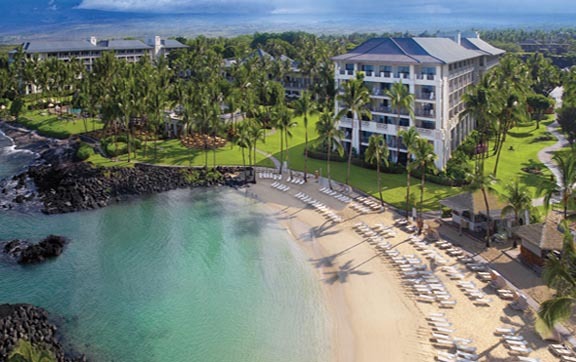 Nestled beachside on the sun-drenched Kohala Coast of the Big Island, Fairmont Orchid, Hawaii extends a warm e komo mai (welcome) to today’s sophisticated travellers. Comfortable guest rooms, each with its own private lanai, feature waffle-weave, tropical-weight bathrobes, exclusive toiletries, coffee maker, minibar / refreshment center, cable TV, hairdryer and iron / ironing board. From the beautiful beach to the 10,000-square-foot swimming pool to the world-class tennis courts to the award-winning 36-hole golf course, there is no shortage of enjoyable activities from which to choose. The unique Spa Without Walls awaits with a wide range of rejuvenating treatments and services and the Fitness Center stands ready with an array of exercise equipment. Many guests enjoy admiring the views of the sea at the Hale Kai or the Luana Lounge. 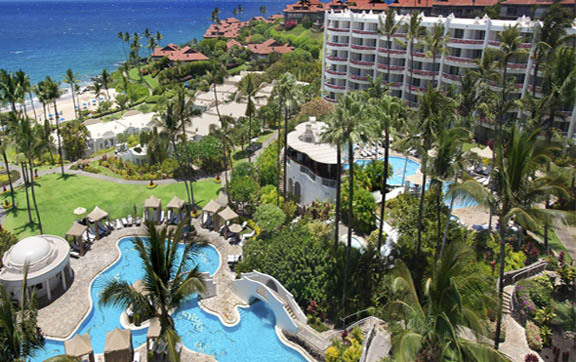 The discerning readers of Travel + Leisureconsider Fairmont Orchid, Hawaii to be one of the 500 best hotels in the world. Ocean-View Rooms. Evoking the ambiance of the days of grand plantations on Kauai with bamboo and wicker furnishings, this 1920s-style Art Deco resort is ideally located on the sunny side of the island. Breathtaking views of mountains, gardens and the sea enhance the lovely setting everywhere you look. Here saltwater swimming pools and lagoons mimic the nearby ocean but are always bathed in tranquility; a choice of restaurants celebrate the abundance of the land and sea; championship golf and tennis courts invite you to play and the Anara Spa weaves traditional Hawaiian healing customs into their array of pampering spa services. Ocean-View Rooms. 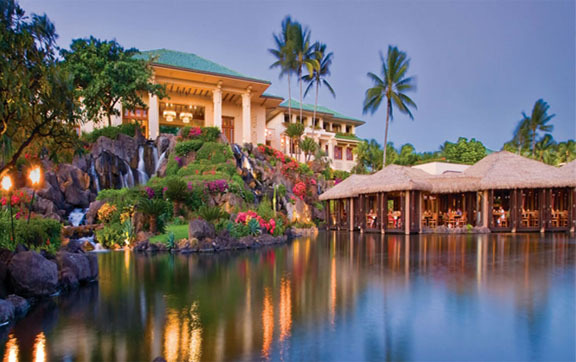 Fairmont Kea Lani, Maui is a distinctive luxury oceanfront resort that is situated on 22 acres of tropical landscape in Wailea, Maui, offering authentic Hawaiian cultural experiences and warm and personal service with aloha. You’ll find your mana (energy) and achieve kaulike (internal balance) at the newly-opened 9,000 square-foot Willow Stream Spa. The new, 9,000 square-foot facility offers a full menu of authentic spa experiences to relieve, restore or provide results in a nurturing environment. Look for the Nalu (Wave) Suite, with a state-of-the art wave table that simulates the feeling of floating, the Wailele (Waterfall) Suite for Vichy Shower treatments, experience showers inspired by varieties of Maui rain, and the pālolo (mud). Other hotel amenities include a 24-hour fitness center and classes, boutiques, three swimming pools including an adults-only pool, two activity pools connected by a 140-foot water slide, various beach activities and nearby championship golf. Both fine dining and casual dining are found in the resort’s four restaurants, which include a gourmet bakery and deli as well as the award-winning signature restaurant, Kō.